This article is about the (former) province of France. For the Medieval Knights Templar member, see Armand de Périgord. For the wine grape also known as Périgord, see Malbec. For another wine grape that is also known as Périgord, see Milgranet. The Périgord (UK: /ˈpɛrɪɡɔːr/, US: /ˌpɛrəˈɡɔːr/, French: [peʁiɡɔʁ] ( listen); Occitan: Peiregòrd [pejɾeˈɣɔɾ(t)] / Perigòrd [peɾiˈɣɔɾ(t)]) is a natural region and former province of France, which corresponds roughly to the current Dordogne département, now forming the northern part of the Aquitaine région. It is divided into four areas called the Périgord Noir (Black), the Périgord Blanc (White), the Périgord Vert (Green) and the Périgord Pourpre (Purple). The geography and natural resources of Périgord make it a beautiful, unspoiled region rich in history and wildlife, and the newly created Parc Naturel Régional Périgord-Limousin aims to conserve it as such. Périgord is noted for its cuisine, especially its duck and goose products, such as confit de canard and foie gras. It is known as a centre for truffles in France. Périgourdine wines include Bergerac (red and white) and Monbazillac. Périgord surrounds and is named after the préfecture (capital) of the Dordogne, Périgueux, and also includes Bergerac in the south and Sarlat in the east. There are Roman ruins in Périgueux which have been restored and the whole area is known as the 'cradle of mankind' due to its wealth of prehistoric sites, of which the most famous prehistoric site is the painted cave of Lascaux, whose depictions of aurochs, horses, deer and other animals (but not of humans) date back some 17,000 years. The centre of pre-historic studies is the small town of les Eyzies, home to the newly rebuilt Museum of Pre-History, where 19th century archaeological investigations established the valley of the Vézère as an unusually rich array of pre-historic sites dating back some 40,000 years. One of UNESCO's World Heritage locations, the valley contains 147 prehistoric sites dating from the Palaeolithic era and 25 decorated caves. Périgord was one of the main battlegrounds of Hundred Years' War between the French and English in the 14th and 15th centuries. It is also the land of medieval and Renaissance castles like Puymartin, Losse, Hautefort and Beynac situated mainly along the Dordogne and Vézère rivers. Other major castles include Jumilhac-le-Grand, Fénelon, Biron, Bourdeilles, Castelnaud, Puyguilhem and Rouffiac (Angoisse). A visit to the province inspired the English novelist Julia Stuart to write her novel The Matchmaker of Périgord. Michael Crichton's novel Timeline is partially set in 1357 Périgord. Claude Chabrol filmed his classic thriller Le Boucher here in 1970, with references to Bergerac and the cinema at Sarlat. The Martin Walker crime novels featuring Bruno Courreges, chief of police, are set in the fictional town of St. Denis on the Vézère river. In Christian Vincent's 2012 film Haute Cuisine (French title: Les Saveurs du Palais), the protagonist Hortense Laborie is a chef from Périgord. The 2013 documentary film After Winter, Spring follows the lives of family farmers in Périgord, including their struggles in the face of real estate development, government agriculture policy, and large agribusiness. ^ "Périgord". Oxford Dictionaries. Oxford University Press. Retrieved March 2, 2019. 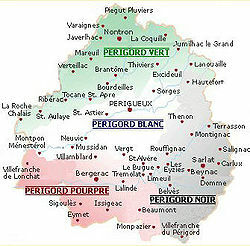 ^ "Périgord". Merriam-Webster Dictionary. Retrieved March 2, 2019. 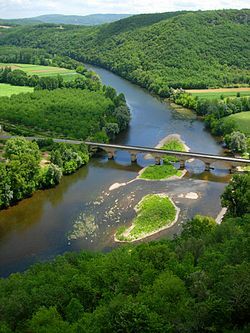 ^ "Dordogne travel guide". The Telegraph. 4 January 2013. Retrieved 8 April 2013. ^ "Parc Naturel Régional Périgord-Limousin". Parc Naturel Régional Périgord-Limousin. Retrieved 8 April 2013. ^ "Foies gras du Périgord". FoieGras-Perigord. Retrieved 8 April 2013. ^ "All About Truffles: Black Truffles from Perigord, France". MirePoix. 2004–2011. Retrieved 8 April 2013. ^ "Author Interview with Julia Stuart". HarperCollins. Retrieved 24 December 2009. ^ "Timeline". Michael Crichton the official site. Retrieved 8 April 2013. ^ Ferguson, Liz (March 1, 2013). "Review: Les Saveurs du Palais (Haute Cuisine)". The Gazette. Montreal. The Cine Files (blog). Retrieved October 9, 2013. ^ After Winter, Spring. Seattle International Film Festival Archived 2014-05-13 at the Wayback Machine. Accessed May 10, 2014.